2009 Honda Civic Pros and Cons | Page 1 of 1 | Why Not This Car? What drives people to buy (or not buy) a certain car? 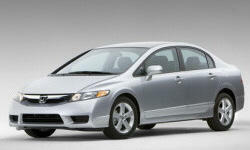 TrueDelta's members share 2009 Honda Civic pros and cons based on their real-world driving experiences. Not bad, but not great. Wishing it was more comfortable. Great 4cyl engine. Smooth, high revving. Not 'buzzy'. This car is obnoxious, but I love every minute of it. Getting around 40 MPG combined 60/40 Hwy/City; more if I go easy on the gas pedal. My 1993 4door DX was replaced this spring by a 2009 DX-VP. It had 203,000 miles. Required one non-scheduled repair. Chicago gridlock, roads, salt corrosion, potholes and the fact I got in 1995 when I was 16year old jackass took toll on it. Tough and Mean! Great response for motor size & car weight. The Si still gets rather good fuel economy, even with a much beefier motor than the other models. This applies to the brand. Very satisfied with the 1992 Accord I had until I bought this Civic. It ranks just below the Prius for MPG. My son who bought a 2008 Civic Hybrid says he is getting better than rated MPG. I am trading in a 2005 Honda Accord Hybrid because the city MPG is not anywhere near what I was led to believe.